19 January 2015 – On 20 January, a verdict is expected in the trial of Nabeel Rajab, a prominent Bahraini activist and internationally recognized human rights defender. President of the Bahrain Center for Human Rights (BCHR), Deputy Secretary General of the International Federation for Human Rights (FIDH), and a member of Human Rights Watch’s Advisory Board, Rajab is charged with insulting public institutions via Twitter. 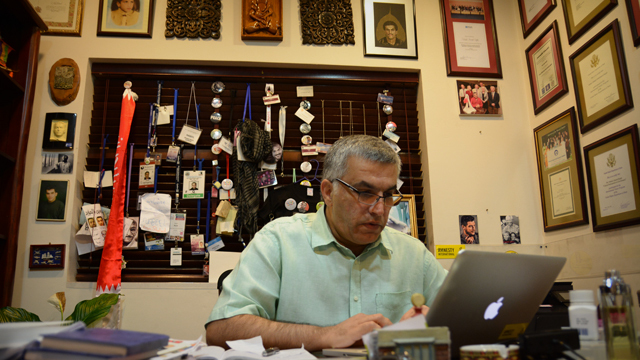 The undersigned NGOs strongly condemn the politically motivated prosecution of and judicial attack against Nabeel Rajab and call on the Government of Bahrain to drop all charges against the peaceful human rights defender. On 1 October 2014, Rajab presented himself to Bahrain’s General Directorate of Criminal Investigations (CID) upon receiving a summons for questioning, where he was arrested after hours of interrogation regarding one of his tweets. Rajab had just returned to Bahrain from a months-long advocacy tour, which included appearances at the 27th Session of the UN Human Rights Council in Geneva and the European Parliament in Brussels, as well as meetings with foreign ministries throughout Europe. Charged with insulting public institutions under article 216 of Bahrain’s penal code, Rajab was granted bail on 2 November 2014, but was banned from leaving the country. Rajab has won many international awards for his human rights work, including the Ion Ratiu Democracy award, presented by the Woodrow Wilson Center, and the British Silbury prize to “facilitate his on-going humanitarian and human rights work.” In 2013, Rajab and BCHR were awarded the Thorolf Rafto Memorial Prize, an annual recognition of those who have devoted their lives to promote democracy and respect for human rights. Rajab was unable to attend the ceremony, as he was imprisoned in Bahrain for his activism. The international community’s response to the current charges leveled against Rajab has been monumental in denouncing the CID and Bahraini government for their actions. Over 100 NGOs and civil society organizations, as well as members of the European Parliament, the UK Parliament and the United States congress have called for the charges against Rajab to be dropped. The United States, Norway, France and the United Nations all made public statements supporting Rajab and called on Bahrain to respect freedom of expression and free public debate. Rajab is one of many Bahrainis who have been victimized by the government’s intensified campaign to silence dissent through judicial harassment and the improper use of judicial and police powers. On 28 December, Sheikh Ali Salman, General-Secretary of Bahrain’s largest opposition party Al-Wefaq, was arrested for his political and human rights activism. Earlier in December, human rights defender Zainab al-Khawaja was sentenced to four years in prison for insulting the king and ripping up his picture, while her sister Maryam al-Khawaja, Director of Advocacy of the Gulf Center for Human Rights, was sentenced to one year in prison for allegedly assaulting a police officer during her arrest in August 2014. These are a few of the many Bahrainis who have been wrongfully arbitrarily detained, charged, or sentenced for peacefully exercising rights protected by, inter alia, the International Covenant on Civil and Political Rights ICCPR) and the Universal Declaration of Human Rights (UDHR). These include rights to freedom of expression (ICCPR and UDHR art. 19), assembly (ICCPR art. 21; UDHR art. 20), association (ICCPR art. 22; UDHR art. 20) and the right to take part in public affairs (ICCPR art. 25; UDHR art. 21). Urge the Government of Bahrain to ensure that civil society organizations and human rights defenders in Bahrain may conduct their work without fear of retaliation or reprisal.